Door of Hope Children's Mission (founded by Cheryl Allen) had been trying to set up a children's village in Winterton, Kwazulu Natal. They had acquired a farm and plans were underway to begin building homes. Eight children had been received and were being taken care of. Everything was in place from staff, to building sponsors and contracts. However, problems arose with a government department who would not allow the home to receive any further children. At that time two labourers worked on the farm i.e.Simon and Musa. Both men had little formal education but were sold out for Jesus and committed to sharing his good news with their own people. Each man started a church in his respective area. Simon in Khetane, a township of Winterton, and Musa in Emmaus, a rural community near Bergville. Attempts were made, on their behalf, for them to receive formal Theological education. However, due to their disadvantaged education they would've been unable to handle the level required. Don Allen then tailor made a Theological course to train them further and develop necesarry skills for pastoral ministry. They have both proved to be men of character and devotion. Despite each man being offered more lucrative work elsewhere they declined saying, "we can't, who would care for our people." After five years of endless red tape and no success, the Door of Hope decided to refocus their attention and handed over the restricted work in Winterton to EkuJesu - another Christian Ministry in the area. Both Simon and Musa remained working with EkuJesu whilst concurrently serving their churches. Simon and his wife Judith remained with the children as houseparents. Musa worked as a labourer. Contact has been maintained since that time and help provided when possible. God then opened the way for Arise MG to come alongside Musa and take on his work in Emmaus as our first main project. 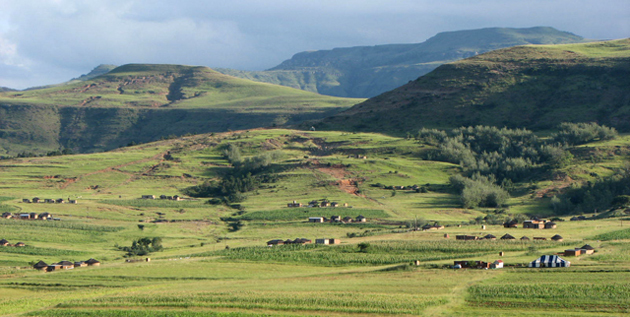 Musa grew up in Emmaus - rural Kwazulu Natal . He only achieved a grade 7 in formal schooling. Eventually Musa landed up in Jail for selling dagga (Marijuana). Whilst in prison a Minister came to preach to the inmates. At first he was resistant. But after a special encounter with Jesus he surrendered his life to Christ. Divine favour saw him released early. Musa immediately went back to his home community and began to preach the good news of Jesus Christ. He intially met with much opposition from friends, family and community members. Yet despite the persecution he persevered. Through his faithfulness and integrity he has attained a good level of respect from the community and has established a growing church. 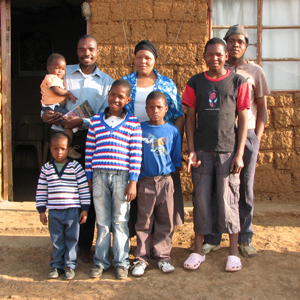 Musa has 4 children of his own and cares for 3 orphan boys from a deceased family member. Consistent with our vision to aid in the transformation of lives and communities of the disadvantaged in Africa, we are working together with Pastor Musa and his church. To this end we are seeking to provide facilities and resources that will cater to the needs of the members of the Emmaus community and grow the church of God in the area. Resources and training will be provided to the leaders of the church and various ministries. Approxiamtely 5 acres of land has been acquired next to Pastor Musa's house. A decent size hall has been built on Pastor Musa's property to be used for church activities and the children's play centre. An architect has completed designs for the centre. Three women have been employed to run the play centre in the hall. 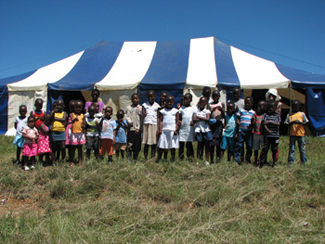 ±60 children (2-7 years in age) currently attend. They receive food and care. The ladies are receiving more focussed training in order to facilitate as much early childhood development as possible. Clothes and other beneficial resources are made available on a regular basis.